What 3rd party libraries are being used by TEAMS products? Glad you asked. Below you will find a table of product versions. Each product version will have a link to the Third Party Library Report. The report will contain all third party libraries used and their versions. How do I configure TEAMATE to send Session Logs back to TEAMS-RDS via Email? Service agents often do not have access to the internet and this may prevent TEAMATE from uploading session logs to TEAMS-RDS server at the end of a troubleshooting session. 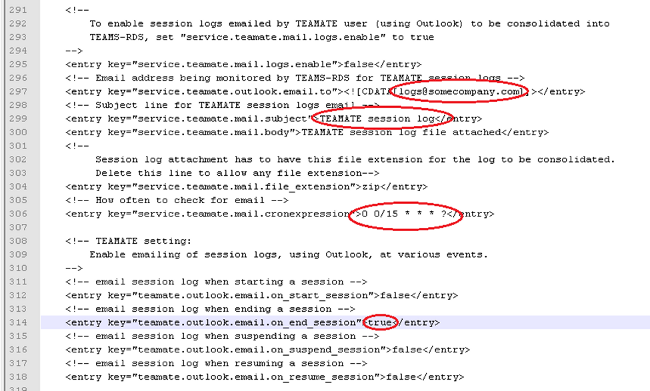 To work around this problem, TEAMATE can be configured to automatically email sessions logs at the end of a troubleshooting session using the user’s Microsoft Outlook email application. The logs are then queued as emails in the Outbox and email to TEAMS-RDS when Outlook has connection to the email server. NOTE 1: Service Agents must have Microsoft outlook installed and configured for outgoing email for this solution to work. NOTE 2: System Administrator will need to setup and configure an email account accessible via IMAP. TEAMS-RDS will monitor this email address for emails with a specific subject line. Outgoing email for TEAMATE needs to be configured for this email address and subject line. 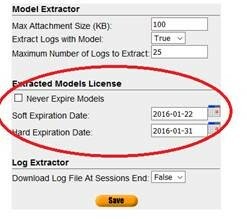 How can I, as a TEAMS-RDS administrator, set my models to expire in TEAMATE after a period of time? Users with role ‘SystemAdmin’ (admin) can enable the extracted models license via Synchronization Options -> Model Update Configuration. There a soft and hard expiration date can be configured. Upon subsequent model sync’s in TEAMATE, the license is downloaded and cached. When the soft expiration is reached, it notifies the user to re-sync with TEAMS-RDS to get an updated license. Users can still perform guided troubleshooting after the soft expiration is reached. Once the hard expiration date is reached, users are locked out from guided troubleshooting until they re-sync with TEAMS-RDS (if they still have access to TEAMS-RDS). As a disclaimer, note that, this does not replace your corporate best practices for securing the intellectual property. A determined user may still be able access the data on the disk or tamper with the clock. How do I configure TEAMS-RDS to use Active Directory for authentication? Instead of using its own database to authenticate users, TEAMS-RDS can be configured to connect to a corporate active directory server to authenticate and authorize users. NOTE – Active Directory support is available only on TEAMS-RDS version 12.x and later. You have TEAMS-RDS version 12.x. TEAMS-RDS is installed on a Linux server. TEAMS-RDS is installed on a Windows server that is not part of the active directory domain. TEAMS-RDS is installed on a Windows server that is part of the active directory domain. Now users can use their corporate account to log in to TEAMS-RDS. They can enter their username in multiple ways, e.g., john.grisham, DOMAIN\john.grisham, or john.grisham@company.com. NOTE – This method is only supported on TEAMS-RDS version 14.0 and later. For TEAMS-RDS version 12.x, use method 1. Now the users can use their Active Directory credentials to log in to TEAMS-RDS. They can enter their username in multiple ways, e.g., john.grisham, DOMAIN\john.grisham, or john.grisham@company.com. A user can also log in as another user, including the users created within TEAMS-RDS by TEAMS-RDS administrator, such as “mike”, frank”, etc. The above setting still requires the user to enter their Windows credentials to log in to TEAMS-RDS. Since the user is already logged into his Windows computer, we may want the user to be automatically logged into TEAMS-RDS, without him having to enter his username/password again. Now, whenever the user visits TEAMS-RDS from his browser, he will be automatically logged in. The user will not be able to sign in as any other user, including the built in TEAMS-RDS users, such as “mike”, “frank”. He will always be logged in as himself. If the user logs into TEAMS-RDS from a colleague’s computer, he will be logged in as his colleague and not as himself! The user will not be able to logout at all! Now, when a user who is a member of “Technical Support Staff” or “Field Engineer” logs into TEAMS-RDS, he will have the privileges of a Field Technician. All the available TEAMS-RDS roles are specified in “%RDS_HOME%/roleMapping.xml”; edit the file to map TEAMS-RDS roles to the active directory memberOf attribute(s) for users. NOTE – The following feature is not available on TEAMATE version prior to 14.0. TEAMATE is already configured to use Windows authentication AND to automatically log the user in. The configuration specified in “%RDS_HOME%/roleMapping.xml” as described above is not applicable for TEAMATE. Since TEAMATE mainly operates in offline mode, it will use the user information that is cached by Windows. When connecting to TEAMS-RDS for model/log synchronization via HTTP, the user will need to enter his Windows credential to log in to TEAMS-RDS to synchronize, even if TEAMS-RDS has been configured for “single sign-on”. From Internet Explorer, choose the Tools/Internet Options menu. Click the “Local Intranet” icon. How can TEAMATE synchronize data with TEAMS-RDS? Typical Scenario: whenever the service agent logs onto the corporate network, a sync is initiated. Requires direct web access to TEAMS-RDS. Laptop has to be carried in and out of customer site. Models and logs are transferred using web-services (XML over HTTP). Requires TEAMATE users to authenticate to TEAMS-RDS. Secure communication (HTTPS) can be be used. Typical scenario: Controlled/Monitored access from customer site. HTTP(S) or FTP server at customer site. Provides transparency to customer IT. TEAMS-RDS uploads model files (XML) to the web-server. TEAMATE downloads models from the web-server. TEAMATE uploads log files (XML) to the web-server. TEAMS-RDS reads log files from the web-server. Typical scenario: When TEAMATE does not have direct access to TEAMS-RDS. TEAMS-RDS saves model files to a “Repository”. TEAMATE saves log files to a “Repository”. Repositories kept in sync using third-party sync software. Repository moved using ad-hoc methods. Removable media like USB stick or CD-Rs can also be used. Used for pushing TEAMATE logs to TEAMS-RDS. Logs sent as email attachment to a “dedicated” email address. TEAMS-RDS continually monitors this “dedicated” email address. Whenever a new email arrives, TEAMS-RDS extracts the attachment from the email, and processed the log attachment. Once the log is successfully processed by TEAMS-RDS, the email is deleted. How do I setup TEAMS-RDS to send jobs via email to TEAMS-PackNGo or TEAMATE and receive session logs? 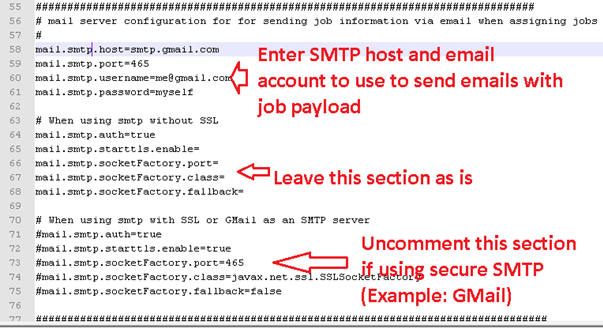 By default TEAMS-RDS is not configured to send jobs or receive job logs via email. In order to enable this feature, TEAM-RDS need to be configured to use a dedicated email account. The email account may be on either an in-house email server, such as Microsoft Exchange, or on a web email service, such as Google’s Gmail. (using pop/imap or SSL pops/imaps). The dedicated email account must have enabled the POP/IMAP protocol (for retrieving emails) and SMTP protocol (for sending jobs via email). In order to edit the configuration files, the user must have administrative privileges on the server hosting TEAMS-RDS. Due to the location of the configuration files, administrators may not be able to edit the files directly in those directories unless the text editor is opened with administrative privileges. We recommend copying the two configuration files to a user owned folder, update them and copy them back to the ‘%RDS_HOME%/conf’ folder. To retrieve session logs via email server, TEAMS-RDS polls the email server periodically for any incoming logs via the specified protocol. Open the file in a text editor, and edit the protocol as shown in Figure 1 below, at the top of the mail.properties file. Uncomment one of the blocks (i.e., remove the character ‘#’ from the beginning of the lines) to specify the email protocol supported by the email server so that TEAMS-RDS server can retrieve emails containing session logs. Note: If more than one block is uncommented then the last block will take effect. The default ports for POP and IMAP protocols are 995 and 993 respectively. They can vary in your organization. So please contact your IT department. Enter the SMTP (Send Mail Message Protocol) to send jobs to field engineers using TEAMS-PackNGo and/or TEAMATE applications on their smart phones or laptops respectively. See Figure 2. 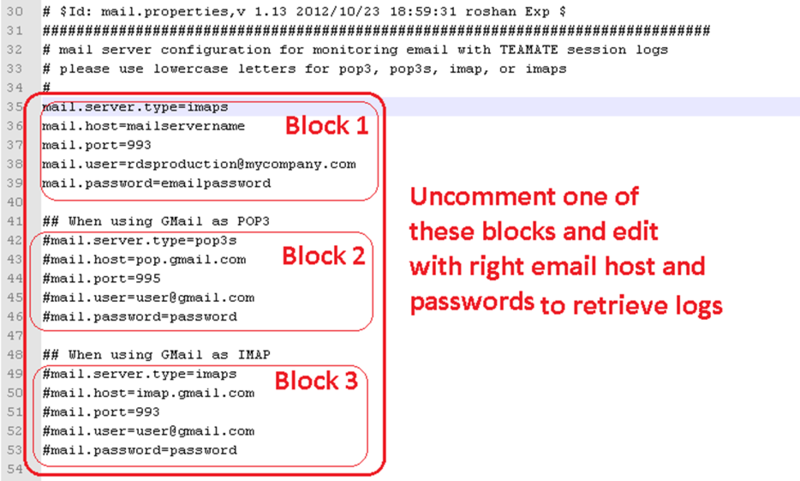 Open the rdsProperties.xml file in a text editor (may require administrative privilege), and enter the email account to be used to send job notifications to field users, and receive the session logs from the TEAMS-PackNGo and TEAMATE users as shown in Figure 3, and Figure 4 below respectively. For PackNGo settings, search for the text ‘service.packngo.resultsemail.to’ in the rdsproperties.xml, and edit as shown in Figure 3. Users can edit the email address to use for sending the job, and the subject lines expected from PackNGo app (so that TEAMS-RDS can poll the email account and look for only those emails with that subject). The subject line should be customized for each TEAMS-RDS server in the organization so that each server can look for the email meant for that server. Users can also specify how often the email account need to be polled for session logs using the cron expression, and also specify at what milestones of the troubleshooting job, the PackNGo needs to send the session logs (for example at the job start, at job close, when job is suspended and when the job is resumed etc.,). Similarly, to be able to send job emails to TEAMATE and receive session logs from field TEAMATEs search for the text ‘service.teamate.outlook.email.to´ in the rdsproperties.xml and edit as shown in Figure 4. Users can edit the email address, and the subject lines expected from TEAMATEs so that TEAMS-RDS can poll the email account and look for only those emails with that subject. Users can also specify how often the email account need to be polled for session logs using the cron expression, and at what milestones of the job the TEAMATE needs to send the session logs (for example at the job start, at job close, when job is suspended and when the job is resumed etc.,). This concludes setting up the TEAMS-RDS server. In you require further assistance, contact our support team at support@teamqsi.com. What are the minimum system requirements for TEAMATE? The user will require access to a TEAMS-RDS server. Without a TEAMS-RDS server, TEAMATE will not be able to download any model to troubleshoot. The following table lists the minimum system requirements for TEAMATE. Disk Space At least 10 GB of available disk space plus additional storage for model data and log files. * Required if log files are sent via e-mail. How do I configure TEAMATE to connect to a TEAMS-RDS server? Select “Synchronization” from the Tasks menu. Under “Model Consolidation” select “http(s)” for the repository type and enter the repository location for the model files. In a default server configuration, the model location is “http://<server_address>/RDS/synchronization/models“. Under “Log Synchronization” select “http(s)” for the repository type and enter the repository location for the log files. By default, the log repository is located at “http://<server_address>/RDS/synchronization/logs“. Click on “Update” to test the configuration settings. Upon success, a message will be displayed above the configuration settings. If an error occurs, please consult your TEAMS-RDS administrator for further information. The repository locations may have been changed from their default locations. Once the repositories are configured, we can start downloading the TEAMATE model files from the TEAMS-RDS server. Select “Consolidate Models“, a list of all the TEAMATE models available to you are displayed. Check all of the models you wish to download and click on “Update“. Once you have downloaded the models you may begin troubleshooting by selecting “Troubleshoot System” from the Tasks menu. How does TEAMATE access models located in the TEAMS-RDS server? File Location: The TEAMATE files and session logs may be stored on seperate folders on a shared network drive. HTTP(s): The TEAMS-RDS server can serve the TEAMATE files via HTTP(s). FTP Service: TEAMS-RDS server can store/access the TEAMATE files and session logs from a FTP server. In a default installation, TEAMS-RDS serves its TEAMATE files via HTTP through the tomcat server that is installed with the installation.